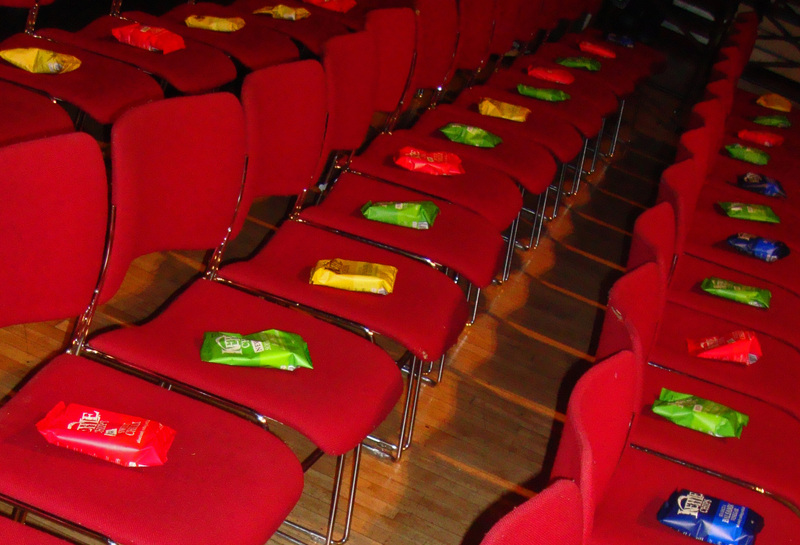 Instead of the usual ‘reserved’ signs that you’d expect on the seats of a fashion show, guests to Jez’s show were greeted with a packet of Kettle Chips, they were everywhere, a packet on every seat in a variety of flavours. These came in very handy during the 30 minute delay to the start of the show. Who doesn’t idly eat when faced with snacks and waiting time? When the show finally commenced, it was to an absolutely eye-popping start. Musical duo My Bad Sister wrestled each other down the length of the catwalk, clad in black micro-mini playsuits made entirely of bin liners. Looking like a feisty pair at the best of times, the girls stunned the crowd by literally tearing strips off each other, leaving black bin liner trailing in their wake as they left the stage. This was closely followed by a change of pace as the auditorium of the Brighton Corn Exchange was filled by the sounds of Goldfrapp, while a troop of models dressed in Lidl’s finest took to the stage. Not since Jason Donovan turned up in the Iceland adverts has a budget supermarket looked so attractive. 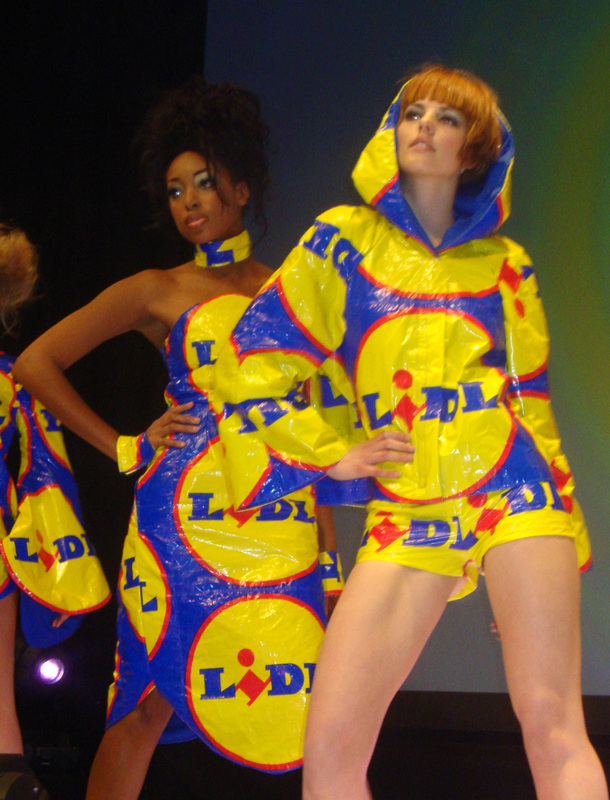 Mini dresses, kimonos and even a hooded shrug were all adorned with the not normal enticing Lidl logo. Another tempo change and a sombre couple emerged performing a slow Tango. More bin liners were used, fashioned into a shiny cummerbund and voluminous bolero for the male, while a head dress made from black rope and wire, eerily reminiscent of the Medusa was attached to the head of his partner. 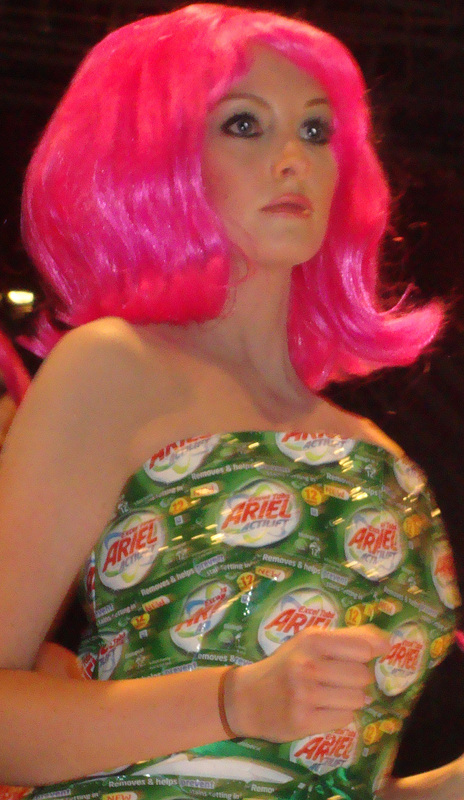 60’s prom dresses were next, printed with the instantly recognisable Ariel Powder logo. These were topped off with retro pink wigs and glassy-eye stares as the colourful model-dolls slowly shoop-shooped down the aisle at a zombie-like speed while old film clips were projected onto the backdrop. The jovial mood was shattered when the stage was invaded by a truly terrifying Poseidon-like creature. A towering 7ft half-man, half-sea monster, complete with trailing bubble wrap tentacles, horned head dress and McQueen style lobster shoes. And to think I used to think Ursula from The Little Mermaid was scary. 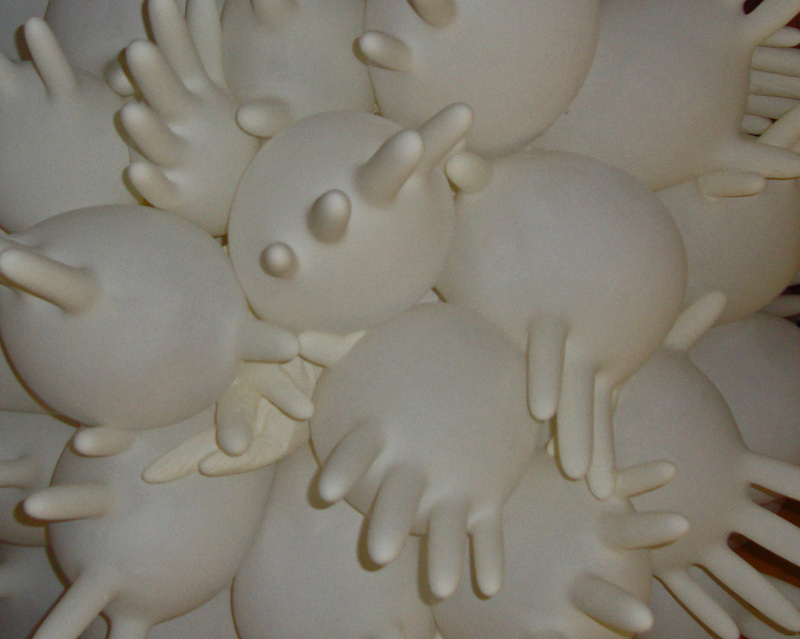 The menacing song ‘Poor Unfortunate Souls’ is now a lullaby in comparison. The monster was followed down the catwalk by 2 writhing females, clad only (only!) in the skimpiest and sheerest of cling film bandeau dresses. I can’t imagine anyone wearing this down the Pitcher and Piano, I don’t care how even your fake tan is. Now as someone with naturally curly hair, I’m never without my umbrella, but I’ve never seen so many put to such spectacular use as I did tonight. 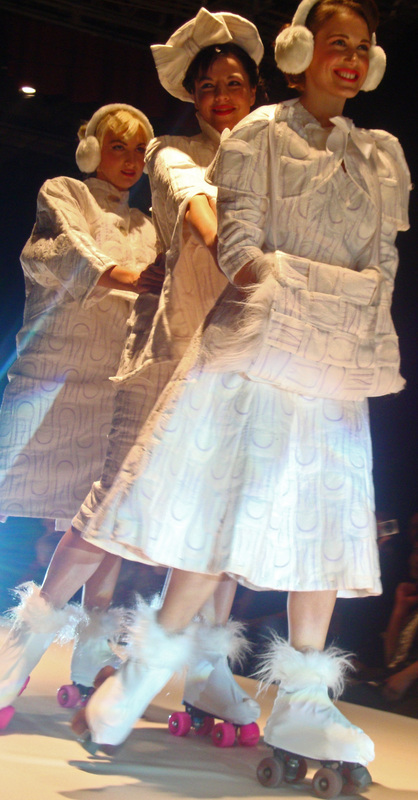 Worn by two sets of models, the first a group of solemn females shuffling down the catwalk looking like a cross between Victorian ghosts and the Scottish Widow, while the second set of baby pink and white creations were worn by 3 drag artists who danced and sang while twirling their umbrella skirts. 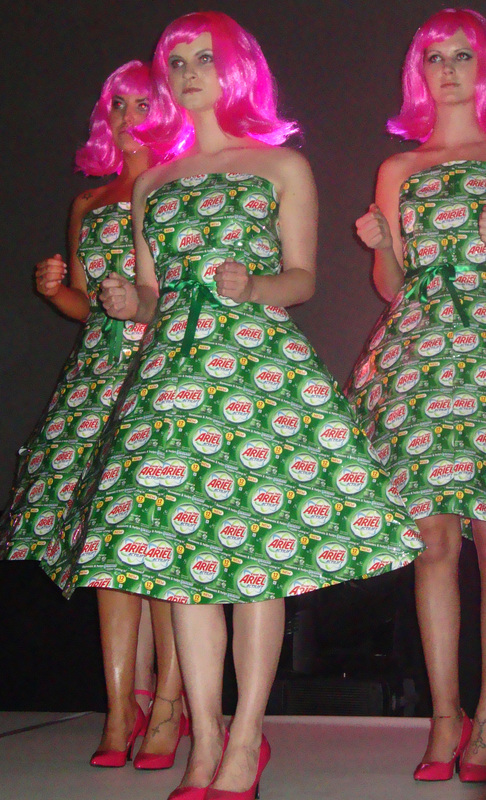 The Cindy doll crinoline was next, worn with a pair of hot pink DM’s and accessorised by a bouquet of flowers consisting of stems topped with Cindy doll heads. Who hasn’t given themselves a fright when their doll’s head popped off when they were younger? Not this girl. The bouquet was the kind of creepy artefact you’d find in the room of a haunted nursery while you were chased screaming into the distance by knife-wielding twins. Chain mail dresses made entirely of condom packets took on a gladiatorial vibe, rubber gloves became bandeau tops, sponges become head dresses, and a metal pan scourer became a bow as Jez Eaton took household items and used them in arrestingly different ways. Bridesmaid’s dresses are notoriously unattractive as brides hate to be upstage, but I can’t imagine anything beating the dress which followed Jez Eaton’s model bride which was constructed from rolls of toilet roll, unravelling and wafting behind her as she made her way down the aisle. A tasteful headdress made from a further 6 rolls completed the look. Without a doubt, the show stopper of the entire collection was an outfit which appeared to be based on the Virgin Mary. This was an outfit that would outshine the baby Jesus in any nativity. A headdress made from a paper doily was haloed with fairy lights. Empty cupcake cases formed shoulder straps and a full skirt was constructed by a frame covered in Chinese fairy lanterns, which shone as the model slowly and steadily paced herself down the aisle. 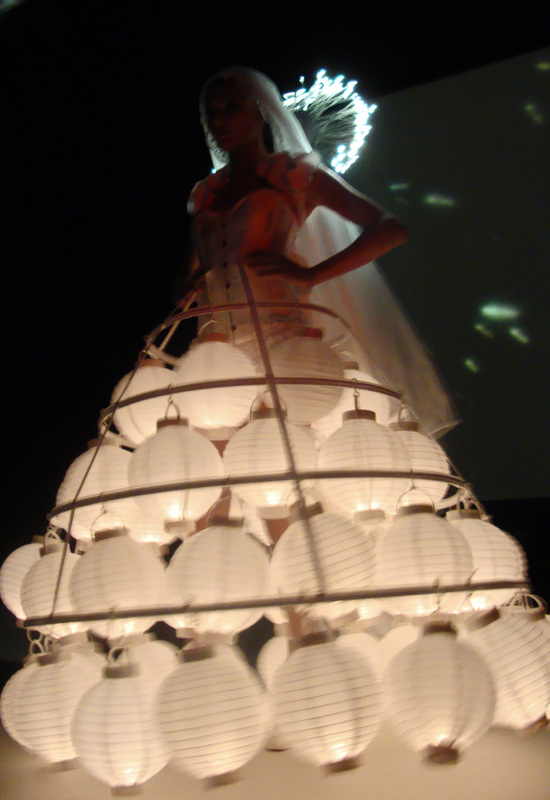 The lanterns lit the darkened catwalk giving the model an ethereal glow. The model looked painfully aware of the potential for electrical catastrophe that could befall her as the lanterns swung from side to side as she walked… no one wants to be thrown from a catwalk by the weight of their own overexcited light bulbs. And before I knew it, it was over. 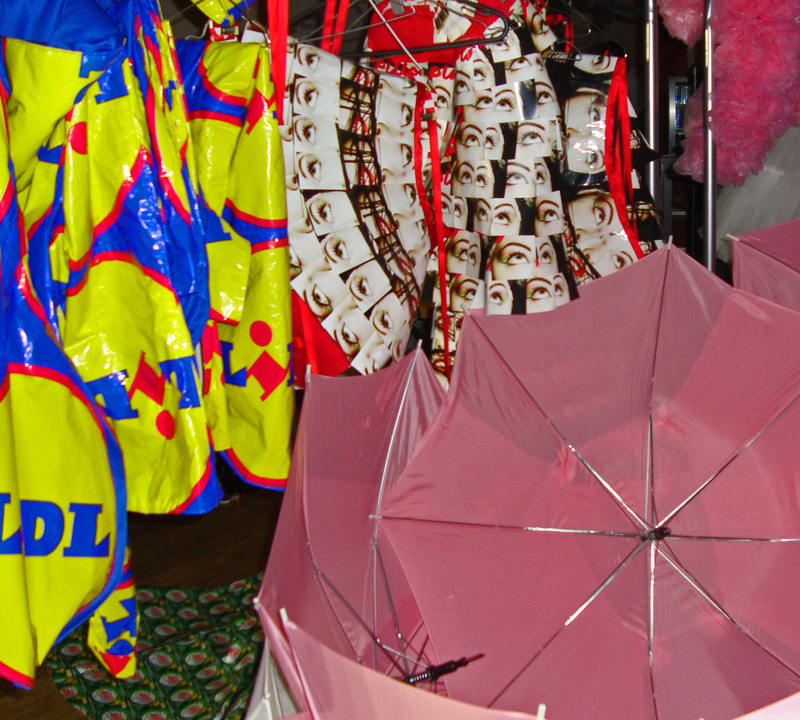 All good things come to an end, and Jez Eaton’s Trashion show was without a doubt a very good thing. Inspiration obviously strikes the Brighton based artist and designer at the most unexpected of times and if she can get this excited by recycling, I can’t wait to see what she comes up with next. Wow. 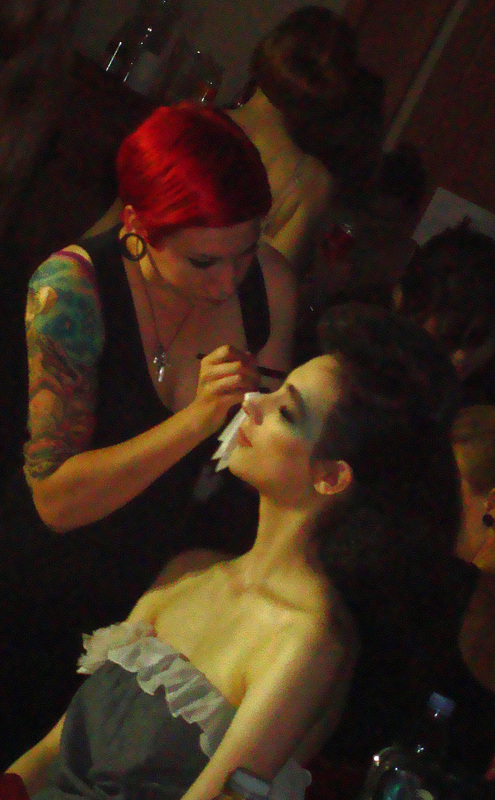 I think I need to start doing fashion photography instead of music photography.